When it comes to creatures of the night, we know there are a few favorites. There's the classic mummy, Frankenstein's monster, zombies, those annoying glittery ones with fangs, and of course the werewolf. It really shouldn't even be a contest when it comes to which creature is better (hint: it's the werewolf). Our human-hound hybrid has not only the strength but also the terror. What's more frightening than an angry dog with a mouth full of fangs and a howl/growl to make you turn and run? Not much. Not only is our wolf-boy strong and terrifying, during they day he can pass off as your average joe and no one's the wiser. Add to that the benefits of being a wolf (the sharpened senses, speed, and oh-so-adorable fluffiness) and the werewolf is the best monster of the night possible. Which is why we have this costume. We know that the whole human/animal transformation process is quite the mess (how many shirts has your little monster ruined?) and we want you to be the proud parent of a monster... perhaps without the cleanup. 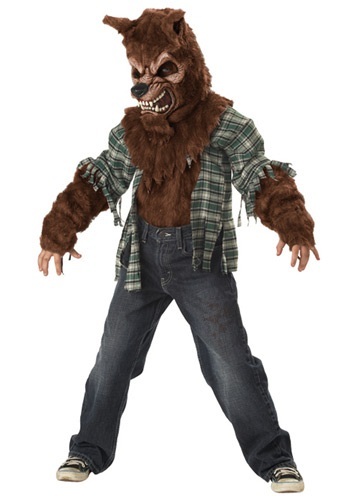 Enter our Kids Howling at the Moon Costume! Your kid can transform without destroying their own clothes or having to strip themselves of their humanity for the sake of a good fur coat. They can still be the alarming night-creatures they were born to be! The transformation and clean up will simply be easier for you. And at that price? Woof.